Some say that gum does not benefit people in the world. But some say otherwise. Gum has many benefits to life and your brain. This flyer will tell you the benefits of gum. Picture a world with technological advancements that us as a species haven't even dreamed of yet. To fully understand how this world can become a reality, we first have to start of in school. School. The birthplace of engineers, scientists, computer geeks, etc. But why does pertain to gum you ask? Well let me tell you. Gum is the most wonderful invention since the invention of toasters. But not many people realize the benefits of the mind that gum has. Gum can be a distracter in class, But I say otherwise. Gum can benefit anyone who chews it. Scientists have taken a study and found that those who chew gum before or during a test tend to remember more about what it is the test is on. 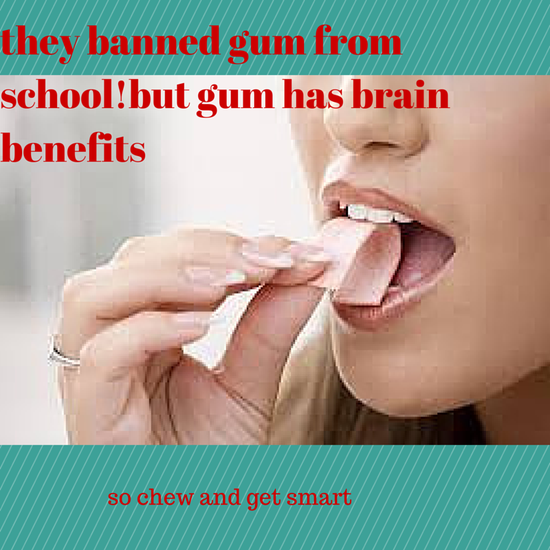 The article: “ Chewing Gum Facts”, says that gum has more good benefits than bad. This states that gum in class can be very helpful for teachers and students alike. The article:”Gum Prohibited In Schools” says that gum is banned in most schools because it’s distracting, destructive of school property, and a whole bunch of other stuff. But looking past that, we find how chewing gum gives better memory, whitens teeth, and improves mind capability, as well as many other things. I have also learned that students who chew gum have an exact 3% better IQ than those who don’t chew gum during a test. Studying this topic has given me a better understanding of how gum can affect the school and students. Schools should let students chew gum in school, because, just look at the last few sentences. They give the best reasons that are out there in the world. If that doesn’t make schools reconsider their gum ban, then I don’t know what will. Remember the future world I was talking about earlier? well this all ties in with what i'm trying to say. If we aren't allowed to chew gum in school, then whats the point of gum? Just a snack that will never benefit anybody, let alone the world. Chewing gum will benefit the world in so many ways that you can't even imagine. For example, global warming. Gum chewers tend to have a higher IQ because they chew. They will be able to solve many of the worlds problems(with a lot of help by smart people). I'm not saying that if you don't chew gum that your not smart. That's not what i am trying to say. I am just saying that those who chew gum tend to have a higher attention span and brain capacity. I hope what I said will make you believe that gum should be allowed in school to help the future of the world. positive idea:I could tell the people that gum can have a positive effect on all of the students in the world, and then tell them how. And then tell them why gum is should be allowed in school. negative idea:Or i could tell them that students that don’t chew gum have lower concentration and IQ levels, and tell them why and how. And then give a lecture on why we should allow gum in schools. and tell the world that the world will be better with gum chewers.